Forecasts and opinions of the applicant test materially Candy LHK No. P 39/2017 is truly fundamental and not irrational. For him, the length of time the permit Utilization effect occurs the practice of buying and selling land plots. Pengktitik this without understanding the mechanisms and procedures designed to Permit the utilization to be 35 years old. As if the permit utilization of it goes away without any monitoring and evaluation of the Government. Is not possible can happen and selling practices of arable land by the poor farmers of the recipient IPHPS. Under Candy LHK No. P. 39/2017, poor farmers of Java will not do the selling of arable land. Why? a. conduct towards the area that has been provided by IPHPS. b. protection from interference, destruction, and pollution of the environment/the takeover unilaterally by the other party. c. Utilizing and managing forest area in accordance with their functions. d. Getting along in terms of application, utilization, extension, technology, access to financing and marketing. e. utilization efforts get results. f. partnership with the STATE-OWNED ENTERPRISES or BUMS. Based on the provisions of the rights of the holder of the IPHPS above, then it can be inferred, there is no right to have IPHPS Holder (proprietary rights) over the acreage has been granted IPHPS. In fact, in chapter 15, expressly defined, members of the group are prohibited of arable land. Second, regarding length (35 years) the holder IPHPS, does not mean the immediate and automatic IPHPS exploit arable land Holders for 35 years. In corporate governance, there is a monitoring and evaluation (Monev) by the Government. If it turns out that in 5 years evaluation results showed holders of IPHPS not carry out obligations, Governments giving notice 3 (three) times in a row within 1 (one) month and imposed sanctions for the removal. Third, there are other strategic control so that it is very unlikely to happen and selling land plots as estimated Applicant/Critics, namely Article 23 subsection (4) sets out, in the framework of the construction and control of social forestry, to members a group of holders of IPHPS Social Forestry Card given by one of the Director-General of the Ministry of LHK (Government). This provision restricts the other party can take advantage of the area of arable land. Will be known sooner if certain parties admit the holder of the IPHPS but surely not a holder of IPHPS because it is not able to show his cards to social Forestry. Fourth, within the implementation of candy LHK No. P. 39/2017, Government or country is present all the time through activities such as technical assistance, granting credit, coaching, facilitation, and Monev (Monitoring and evaluation). The presence of this country is helpful to prevent the success of the parties intended to conduct a sale of arable land. Applicant/Critics seriously wrong predicting and asking opinions about will happen to the practice of buying and selling land plots. Applicant/Critics do not depart from the basic assumptions, the regulation contained in the Candy LHK Number p. 39 already anticipated the problem will likely occur and selling land plots. Forestry policy and candy LHK No. P. 39/2017. 1. The land area that is being and will be done. 2. Currently working on what. 4. The action plan forward. None of the farmer's group spokesman alluded to the existence of arable land sale and purchase. After they received the DECREE IPHPS, they even considered themselves independent. They are from a certain emphasis and intimidation pihak2 about land use. On the other hand, the author had time to dialogue and interviews with some of the leadership of the Social Forestry farmer groups referred to related issues and selling land plots under Candy LHK No. 39/2017. All of them replied it is not possible because there is the supervision of their group. 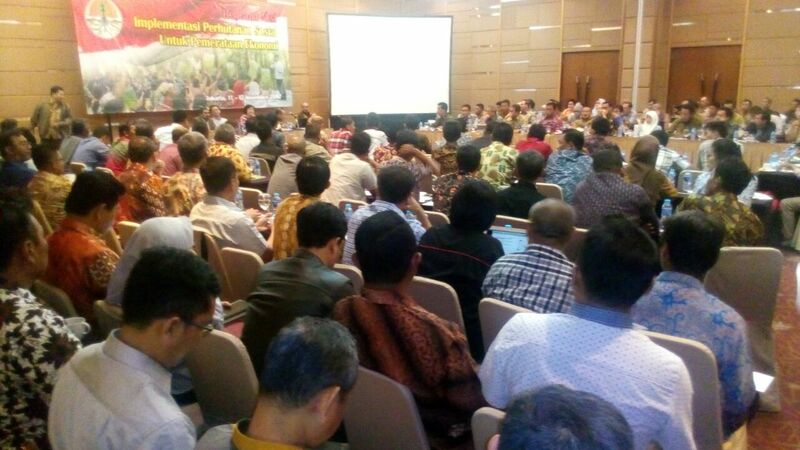 Forest land use allowed the Government is inseparable from the cooperation and supervision of group recipient IPHPS. This kind of based on self-portrait (experience) in the past, but not under Candy LHK No. P. 39/2017. Is not making this up if we ask the team Judge MA for refusing the application for a test materially Candy LHK No. P. 39/2017. The reason, argumentation IPHPS receiver will do the buying and selling of land plots will not happen and merely to cancel pro-poor government policies particularly in Java.